Forespar® has perfected the art of manufacturing carbon fiber equipment not only for the blue water yachts and racers but now for the recreational sailor as well. We have manufactured standard composite poles for over 10 years. 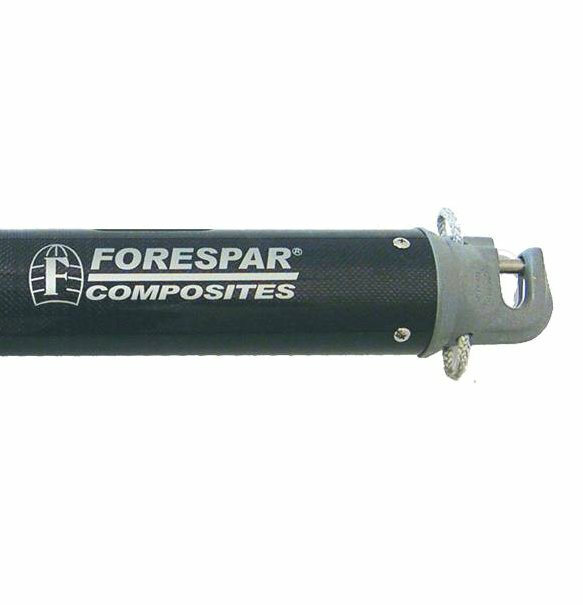 We made our first carbon fiber mast in 1979, ten years before anyone else in the U.S.
Forespar® is the world leader in standard composite whisker poles, spinnaker poles and reaching struts. Standard sizing is 2” – 6”. Spinnaker poles are offered in double tapered as well as parallel configurations. In addition, we custom design and make poles or bow sprits specifically sized for the head sail of your choice; code zeros, asymmetrical chutes, spinnakers or roller furling genoas. Typically a composite spinnaker pole will be 40% lighter than a similar aluminum pole yet almost 50% stiffer. Fixed length whisker poles and bow spirits are 50% lighter. All Forespar® poles are manufactured in the U.S.A. and assembled in our California plant by professional riggers. HIGH MODULUS ENGINEERING, the premier composite design firm for the 2003 America’s Cup racing, is our partner in design and brings to the Forespar® design efforts the wealth of composite engineering learned during this year’s cup races. Forespar poles are priced and delivered un-coated as they come from the mold. For appearance and UV ..
Forespar Spinnaker Pole, Carbon, 3" UTR-UTR Max Length 13' 1/2"
Forespar Spinnaker Pole, Carbon, 4" UTS-GP, Max Length 18' 6"